Club Rush, Salt Lake Community College’s annual club showcase event, took place over three days last week at South City, Jordan and Taylorsville Redwood Campuses. Club Rush is not the only opportunity to get involved. Most clubs are still open to accept new members at any time, although sports clubs often enforce a tryout deadline. Students are able to join or even start a new club from any campus. Four easy steps to starting a club can be found at www.slcc.edu/clubs-and-organizations. Students can get information and a full list of clubs at the Student Life and Leadership office located on the second level of the Student Center at Taylorsville Redwood Campus or online at slcc.edu. Club Rush is designed to bring awareness and boost membership for the great variety of clubs that SLCC has to offer. These groups are formed to unite students with similar interests, hobbies or even cultural backgrounds. “I think having something to be a part of makes school much more bearable,” said Caitlin Prentice, Student Life and Leadership Vice President of clubs and organizations. Each year at Salt Lake Community College over 60 clubs and special interest groups are formed. These groups often enhance the quality of student life by fostering social interactions, leadership development and a connection to the college by promoting diversity, service and learning outside the classroom. “If you’re a part of something then you’re more likely to finish your degree because you won’t just go home after class; you have a connection to the college,” said Prentice. SLCC is one of the most diverse colleges in the state. A large mix of culture and diversity means a large mix of clubs for students. Clubs are formed by students, for the benefit of students as they promote overall wellness and quality of life. Special interest groups are located across the Salt Lake valley at all 13 campus locations. These clubs range from Phi Theta Kappa, which recognizes and encourages scholarly academic excellence among two-year college students, to the Chess club that fosters cross cultural friendships through chess. At this year’s Club Rush, the majority of SLCC’s clubs were represented at Taylorsville Redwood Campus due to the larger capacity of students and various areas of study. South City and Jordan Campus each hosted ten clubs or more. Not all clubs are free. 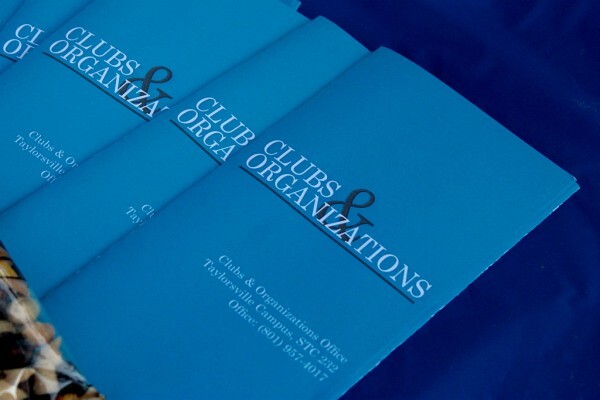 Clubs generate their own funds, so many require a minimal fee, and fundraisers are often held to generate larger funds. For example, the Black Student Union Club charges five dollars to become a member, and they also host a dance each semester to help raise funds. “We raise money from the dance to buy and donate toys to Toys for Tots,” said Black Student Union member Nora Esquivel. Special interest groups like these form a support group for students. Students are encouraged to have a voice and get involved. Real world activities such as fund raisers inspire students and create leadership environments and hands on experience.